Discussion in 'General Discussion' started by cubby61, Nov 7, 2018. My passion for PRSi has given me a problem. I have run out of room on my wall to hang my guitars. I have a single slatboard where I can hang my guitars but after recently purchasing a couple of Private Stocks I don't have room to hang them all (including some other brands). I was thinking about covering the wall with slatboard like you see in some stores but everywhere I look the price is starting to get kind of expensive. My original board came from Diamondlife products and I have been very happy with it. 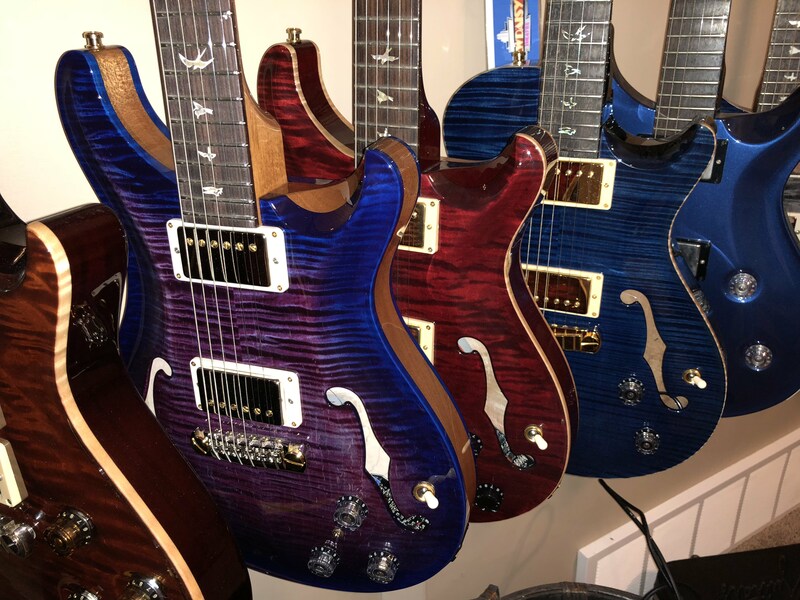 I got a recommendation from Brian at Brian's Guitars because I like the way his wall display looks but again, it will probably be cost prohibitive. I have thought about just running another single 8 ft section below what I have and arranging them so the necks on the lower ones are between the bodies of the ones on top but I'm not sure I will like that look (2 single rows of boards). So I thought I'd ask you guys what you have and what you like and what ideas are out there for consideration. While it doesn't show my latest Private Stocks, here is what I am using now. 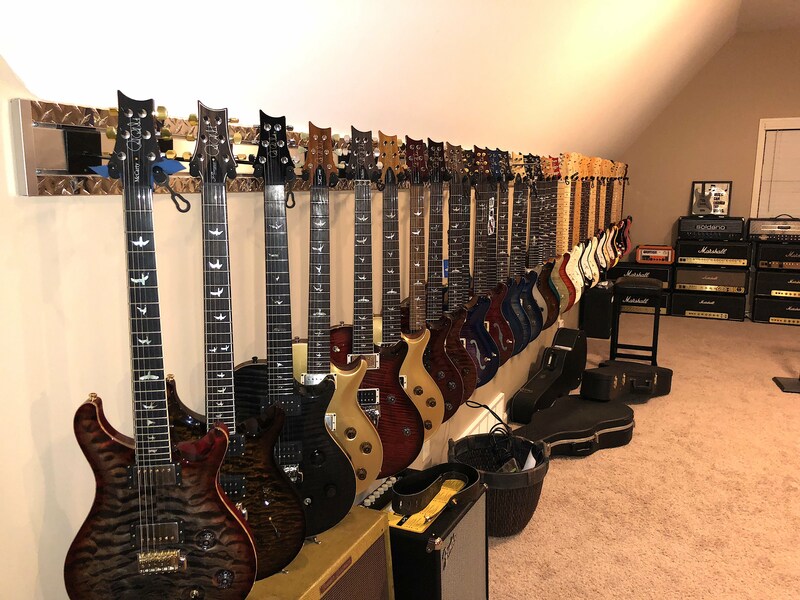 Feel free to also use this thread to show off your collections to demonstrate ways of displaying guitar collections. They are after all, works of art. 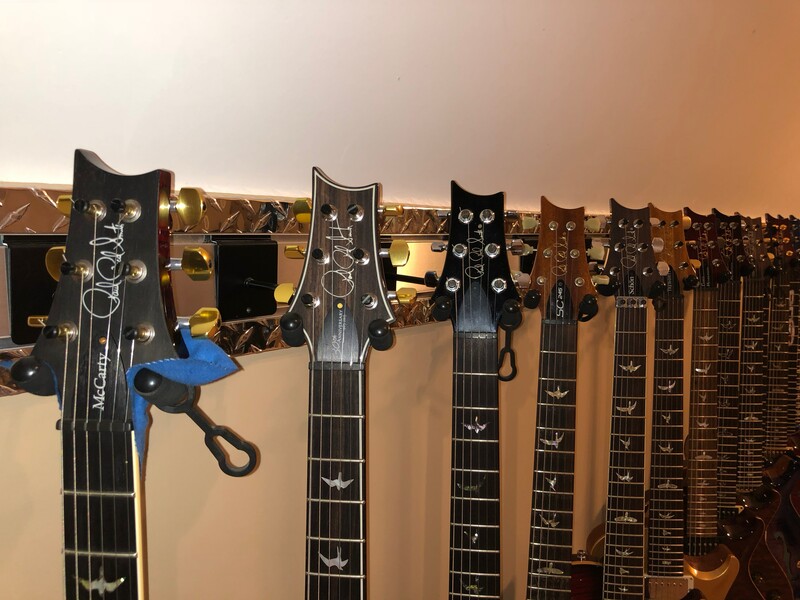 Why are you hanging non-PRS guitars?? I ran out of room on the walls, too. At least the spaces that I could use. I ordered a 4 ft board from Diamondlife and have 5 guitars hanging on it. The hooks are at a pretty big angle. I'd say they're at about a 45 degree angle to the wall. I could get one more on there, if I needed to. The very best, classiest way I’ve seen to hang and display guitars is Veinbuster’s music room guitar cabinet. It’s gorgeous, and truly shows them off while offering protection at the same time. Veiny really knows how to do things right! Those slat things remind me of being in a store. 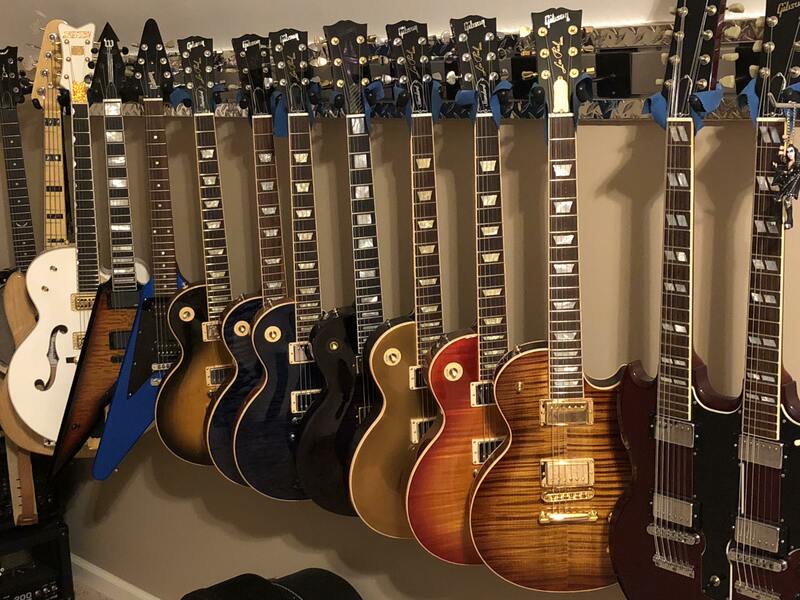 I get the desire to have a convenient place to hang things, but does making a home look like a store crowded with merchandise really show each guitar to its best advantage? If you’re going to hang them on walls, why not give each one a little space, on its own hook, where it can be looked at individually and appreciated? After all, you wouldn’t hang 8 or 10 fine paintings in one little area of one wall. You’d spread them around so each one could be admired on its own. dmatthews, veinbuster, sergiodeblanc and 1 other person like this. I agree here. It's not so limiting to go right into the wall w hangers. You can get a lot more variety in positions and places you want to hang em. You don't even need to go into wood. I put them in w wing nuts in the back and they hold very strong right in drywall. Never had an issue. There is actually a hangar on a swivel mounted on the wall. There are 2 arm hooks at he bottom that will hold the body and one at the other end to cradle the neck. Would work perfectly for you to hang it horizontal or on an angle or straight up and down. I want them to see what real guitars look like! Ovibos and Glide-bpm like this. Les I get what you are saying. This room is my home theater and the other side of the room houses my nostalgic "home studio". I don't use it but it adds to the theme of the room. This room is also over the garage 20x20 so it is my sort of man cave. Since it isn't part of the normal flow of the house I'm okay with the store look. 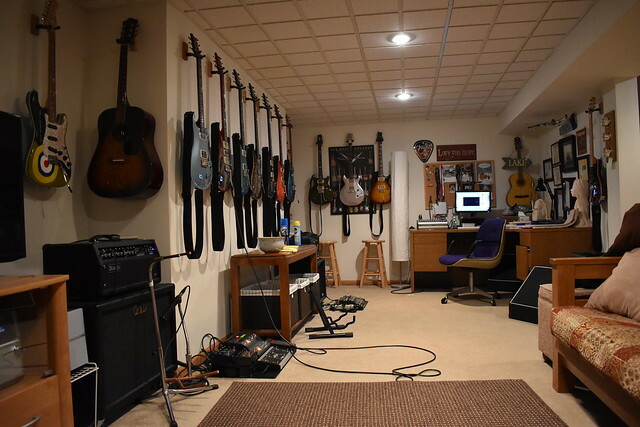 I am highly considering using a separate hook for each which will showcase the guitar and not the hangers but I wonder what happens if I decide I want to move things around a little then I have holes to patch whereas the slat wall makes rearranging easier. This is the only wall in the room where hanging guitars makes sense so all 13 need to fit on this wall. (Come to think of it 13 is an unlucky number so I think I'll have to add at least one more to the collection). I'll check out Veinbuster’s cabinet to get some more ideas. bodia, veinbuster, LSchefman and 1 other person like this. Easy fix. turn them sideways and add more guitars! Still shows off the tops! JohnPRS, bodia, Ovibos and 4 others like this. I had the 64 input spli-console 16 buss version of that Tascam mixer series back in the day! Great stuff. Tell me more about the two-track mastering deck; reminds me of some that I worked with back in the day! Holes are pretty easy to patch over these day. Plaster comes premixed so you just slap some over the holes, swipe it with a nice wide putty knife and repaint the wall. Glide-bpm and dmatthews like this. I would love to have more vertical space so I could go 2 rows not happening at my place. That is an old Scully deck that my best friend and I used to use at a Radio Station back in our early 20's. We did so much work on it when the station started upgrading we bought it from them and packed it away. 30 years later I finally got around to unpacking it, now having a suitable place to display it. The roller was were dry and cracked but it still powers on and lights up. I'm trying to find a replacement for the roller but as you can imagine it's not easy. I may have one made that looks the part. just for show. It's more of a conversation piece now. To all who responded, first of all you guys have some great collections. Second I'm thinking maybe just adding a second single row may be the best way to go. Painting the board to match the wall may help them to disappear and not take away from the guitars. Which ever way I go I'll post a pic in this thread to let you know which way I went. Thanks again for the pointers. matt3310 and bodia like this. Awesome! I own an old Otari mastering deck (MTR15) that’s at a studio I’ve done some consulting for, but I’m told it needs a new motor and some other work. So I’ve never picked it up. I don’t even know if they still have it! I traded them an old Sony 3/4” U-matic machine for it 9 years ago, so you can see what kind of hurry I’m in. However, there are companies making tape machine replacement parts and keeping them alive. You’re no doubt aware of this, but there’s a highly regarded company in Chicago that rebuilds them, and I’m sure there are others out there. I really should look for some pics of my old studio with that M600 console; it was a good sounding one (though I rarely used the mic preamps, I usually went outboard), and I used it from my Tape Jurassic Era to my own Digital Stone Age. But then I replaced it with a Neve summing mixer and went in the box. So there’s that. Anyway, if I remember, I’ll find a couple and post them. I do miss my analog gear sometimes. I also miss the smell of a reel of tape after the machine runs it a few times. Analog tape widens the stereo field when you use a good machine - which the Scully certainly was - and it’s hard to replicate exactly what it does with a plugin, though you can come crazy-close! I have a half dozen or so reels of Ampex 499 in my storage room. Ten years ago I sold the rest of my used tapes to a studio in Russia, both for my old quarter inch mastering deck, and for my old 16 track. Now I wish I’d kept both machines and my console. Go figure.